Are Social Media Tweeps Always Good Marketers? I spend a lot of time using social media "stuff." You know, Twitter, Facebook, reading up on blogs, all that fun and "cool kid" stuff. I help manage and build the online community behind the B2B company that I work for so I've had the opportunity to see social media from two different perpectives: The social media "fanboy" side and the practical "drive more business" side. What is the one thing people like to talk about on Twitter more than anything else (yes, even Justin Bieber)? Twitter. People get on Twitter to talk about Twitter. Heck, I even do that. I love to learn about new ways people are leveraging different platforms for business success. However, a lot of us use social media to help teach others about social. What about those folks out there that aren't online? The bare essentials of marketing include target marketing. If you want to teach people how to get online and use (insert social network here), you probably shouldn't use said social network to get that message out. Using Twitter to try and convince people to let you help them with Twitter makes as much sense as making ads for a store...and then only placing those ads within the walls of the store. If we really want to educate others, we shouldn't just be spending time talking to other people that "speak our language." We have to go where people are at. Sometimes that's even offline. Conferences do a great job of accomplishing this (face to face is terribly underrated). I've also experienced a bit of this in my own work. Currently I work in the marketing department of an incentives company. To be frank, the incentives business isn't the "sexiest" or "high tech" business out there right now. Except for a handful, the industry as a whole is behind on adapting web 2.0 in their businesses. We have an upcoming trade show here in less than two weeks - arguably the biggest event for that industry. A small few of us wanted to drive more social media useage at the show and were trying to figure out how to spread the word. After all, the show did have a Twitter hashtag, but that would only reach people on Twitter - people that weren't the main target of our efforts. We wanted the industry to at least learn more about how these tools could work for them. Most of the communication done in our industry is done via email and the occasional LinkedIn message. 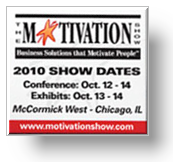 Knowing that interested (yet inactive) parties would probably be there, I posted a blog about who at the Motivation Show was doing what (tweeting, blogging, geolocation etc) knowing that word would spread to our email subscriber base. I also posted discussions to relevant LinkedIn groups, knowing the discussions would appear on the home page and hopefully drive some interest. Over time, we've seen more companies come out and help raise awareness for adding that extra social sharing layer to the show. In addition, using our company name to drive discussion, we'll hopefully be able to drive some buzz and generate solid PR around the company name. After all, that's what they pay me for at the end of the day right?